It was on this day 200 years ago, 3 January 1813, that Bennelong died. 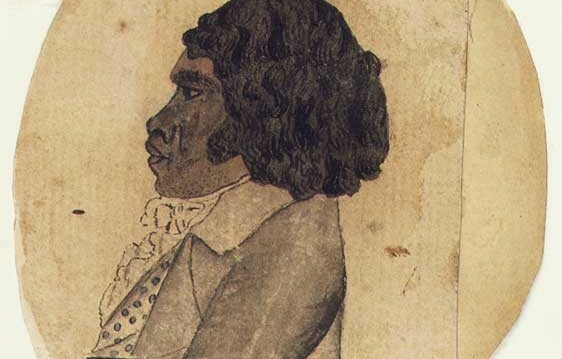 Bennelong was born around 1764 and belonged to the Wangal clan of the Darug language group of Aboriginals, commonly referred to as the Eora people, the Aboriginal people of the Sydney area. The Wangal were the traditional custodians of the south side of the harbour stretching from Darling Harbour to Parramatta and centred around the present day municipality of Strathfield. Aged in his mid-twenties when the First Fleet arrived and established a British colony right on his doorstep, Bennelong was described by some as an influential man amongst the Aboriginal clans living around the harbour, but some refer to him as a “cheeky bugger” and an opportunist, who welcomed the opportunity to befriend the colony’s governor, Arthur Phillip, in an effort to obtain an ally against the Cammeraygal clan of the North Shore, whom he reportedly hated. We will never know the exact details and there is no written legacy by the man himself about his motivation. Thus we have to rely on the written accounts by the early colonists, such as Phillip’s and other officers’ diaries as well as Aboriginal stories. It is undisputed that Phillip was under instructions from King George III to seek friendly relations with “the natives” and that Phillip’s attitude, while paternalistic and patronizing, was in general benevolent. Regardless, it was not easy to “befriend” the Aboriginals in order to learn about their language and customs, and thus, without further ado, Phillip had a couple of aboriginal men abducted at Manly Cove on New Years Eve 1788. One captive managed to escape, but the other, Arabanoo, was brought back to the settlement, where he was kept handcuffed or chained until his death, less than half a year later, from the big small pox outbreak of 1789 that killed approximately 2000 Aboriginals around Sydney Harbour. Governor Phillip later ordered the kidnapping of another two aboriginal men, Colbee and Bennelong, to give his “education scheme” a second chance. Again, the one escaped, but Bennelong stayed, albeit involuntarily. It was only until later, after the Manly spearing incident, that Bennelong and Governor Phillip became close friends, culminating in Bennelong calling the governor “father” and giving him the Aboriginal name Wolawaree and even accompanying him back to England, where he supposedly met King George, before returning to Sydney with Phillip’s successor, Governor Hunter, in 1795. During Governor Phillip’s time, Bennelong lived in a hut on a headland to the East of Sydney Cove, which has since been named after him and is home to that most famous landmark of Sydney today – Sydney Opera House. In later years he moved to the North Shore of the Parramatta River, just West of Kissing Point, where he led a 100-strong clan by the early 1800s. It was here that he died on 3 January 1813 and was buried in the orchard of his friend and famous colonial brewer, James Squire. It is quite ironic that the regular and excessive consumption of alcohol has been a major contributing factor to his demise.